OPEN. 1. Is there a special decoration or food that means “Christmas” in your house? What is it? What makes it special to you? UNPACK. Read Ezra 1: 1–4 and 3: 1–4, 10–13. 2. Ezra 1: 1 says God stirred up the spirit of Cyrus. What are some reasons that Cyrus might have been persuaded to return the Judean Exiles so soon after he had conquered Babylon? 3. What terms in 1: 3–4 suggest the return to Judah was voluntary? Given that Cyrus had conquered Persia, Media, and now Babylon, was his suggestion something that could be refused? Why or why not? 4. You wouldn’t build a kitchen counter before laying the foundation of a house. Why would the returning exiles rebuild the altar (3: 3) before the Temple’s foundation (3: 10)? 6. Why did the older Exiles weep when they saw the Temple’s foundation? Should the leaders have waited until the Temple was more impressive before celebrating? Why or why not? APPLY. 7. In 1 Peter 2, the Apostle writes about another Temple whose cornerstone is Jesus. What stones are used in its construction? What does that mean? 8. 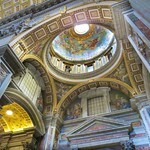 Which is more impressive to look at: the “Temple” that Peter’s describes, or earthly “Temples” like St. Peter’s Cathedral? Why? 9. How is the “Temple” Peter describes superior to the one the returning Exiles built? How many things can you list that make it Temple better?